Joe had something to do down at the Eaton Centre and I decided that I'd like to go along for the ride. It was bitterly cold out and we'd forgotten to charge the battery on my chair so we decided that we'd subway down and walk back - if the battery was holding out OK. So we made our way over to the Bloor subway stop and hopped on the train. It was busy, being the holidays, but we were surprised to be able to get on without any problem. Often we have to wait a train or two to before there's enough space for me to get on with the chair. I got on and swung round backing into place. Joe sat on the chair next to me and the train left. Two stops south, near the College stop, the train began to slow. A fellow got up and headed over towards us. He announces, quite loudly, that I can't get off at College because it's not accessible. Now, I know that. But he wasn't really telling me, he was letting everyone know that he knew about which stops were accessible and which were not. Then, he leaned past me to be able to talk to Joe and said, "I know because I've got five of these myself." When saying this he had his hand over my head pointing down at me. "Five! I've got five wheelchairs" he continued, "so I know." I turned to Joe and said, "And you only have one." My remark struck me, alone, as really funny, and I started to laugh. The train was now stopped and he got off looking a bit discombobulated at my laughter. It was so absurd as to be ridiculously funny. Everyone on the train around me looked mightily uncomfortable on our ride to the next stop where we disembarked. I don't know if they were uncomfortable because of what he said, because of what I said, or because I was kind of giggling for that part of the ride. Just before we got off, Joe, who had been shell shocked by the weirdness of the interchange, had gathered himself enough for a response. "I may only have one, but I'm betting mine's bigger." I had to stop, once off and dry my face. Sometimes laughter is the only response possible. It's been a difficult season for me this year. On the 23rd I was victim of a pretty serious attack on my character that was public, completely uncalled for and horribly humiliating. Since then I have had a great deal of difficulty enjoying the season. I love Christmas and wait for it with bated breath but this season that train got pushed off the rails pretty forcefully. Luckily, in terms of this blog I had written the Christmas Eve post, Christmas and the Magic tree, a week or two ago so I had a post written, while anticipating happily the big day. 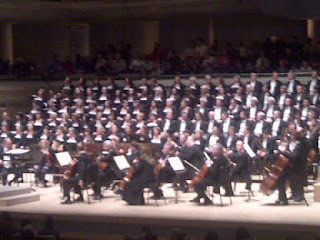 I had written about going to Roy Thomson hall on the morning of the 23rd and, after the Messiah, I wanted to focus on how well the staff at the Hall did at welcoming us, and others with disabilities - I didn't want to write about the fact that I had been traumatised hours earlier and as a result had a very difficult time being there and found it even more difficult enjoying the music. I used the picture I took of Joe for a blog post on Boxing day after I tried and failed to write a bit about the day. I just couldn't find either the will or the energy. I'm writing this today to tell you, as much as I find myself able to, about where I am right now and how it might affect my blogging here at Rolling Around In My Head. On Boxing Day, itself, Marissa and Ruby and Sadie came down to spend the day with us. The kids were staying the night because their mom was going from dinner here directly to work. They rushed through the door, driven, I hope by the excitement of seeing me as well as the undeniable draw of unopened presents. It wasn't long before presents were being ripped open, and as much as we tried to put a bit of organisation to the chaos, it was delightful chaos. Clothes and toys and books and DVDs and CDS were unwrapped, examined for a millisecond before another was grabbed. There was paper and presents everywhere. Ruby and Sadie both pulled me, firmly, out of myself and suddenly, Christmas was here. I am not one of those who say that 'children make Christmas' ... or 'children show you the joy of Christmas' ... I don't believe that. Joe and I usually manage a perfectly wonderful and perfectly joyful Christmas all on our own. What children can do, and do well, is take up so much room in your heart and mind and soul that there isn't space for the intruding thoughts of hurt. When Marissa left I told her that the girls were, without question, the best gift I received this year. Marissa knows what happened to me, and knows that I'm having a rough go of it, fighting tears and pushing back a sense of bleakness is hard work and she knew how deeply I needed a break from all that. I wanted her to know that her visit complete with children and chaos and watching her put together a DVD rack, their families gift to us, complete with 17 thousand pieces, while the kids tried to play fort in it, was good for me. Really good. Near the end of the evening I was curled up on the couch covered in blankets, Ruby and Sadie each got a blanket and came and joined me. We watched a DVD set we purchased for the kids and waited for them, one by one, to fall asleep. Sadie went first, crashing into sleep about half an hour in. 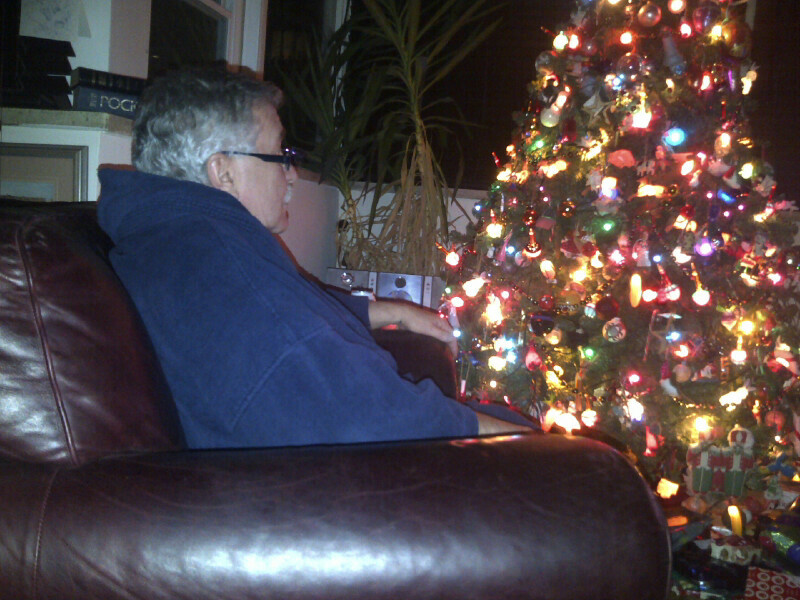 Ruby was intent on watching the DVD and got drowsy but didn't fall asleep. When she asked for one more episode, we told her that we'd gotten a new book to be read when they went to bed. Joe went and got the book and handed it to her so she could look at it, she held it in front of her, looking intently at the cover, "If," she said, her voice slowly growing confident," You Give A Mouse A Cookie ..." Then she turned the pages and found the first page of the book. For the next five minutes we sat there as Ruby read several pages the book aloud to both of us. She looked up and said, "... OK, you can read the rest." We both knew how much Ruby wanted to be able to read as she's been talking about wishing she could read since she was barely three. She has names down and can write all of our names and can recognise every letter of the alphabet, she's had that for years. But reading was always just out of reach until now. 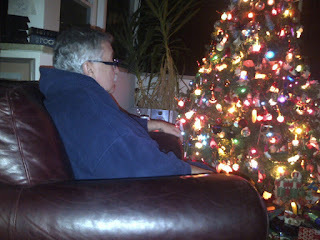 Sitting listening to her read to Joe and I, I had this sense of peace and joy, that has been missing from the season. It was wonderful. Right now, though, as I type this, the girls are asleep in their bed and I am here at the computer, trying to write this while thinking about 'that which happened.' Writing anything, it seems, is hard. So, dear readers, I am going to continue to try to write a daily blog, I have to deal with what happened, and I don't think right now, going public with it would be wise. I need to consider what my options are, and I need to find a way to move past what happened. It's like I've been hurt in a deep and profound way and, though I'm used to, as much as one gets used to, the prejudices that come towards those of us with disabilities or those of us who are fat - I always had something that was much more important to me that the superficiality of the judgements that came from appearance - I had me, and I know who I am. But my 'me' was attacked and has been bruised. I am damaged in some profound way right now. So forgive me if the next few days or weeks, my writing suffers because of it. 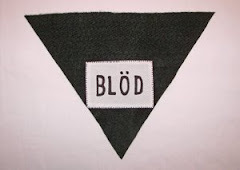 But I'll try, I am committed to this blog and to those who come here faithfully and will try to meet those commitments. This is the wishing tree. 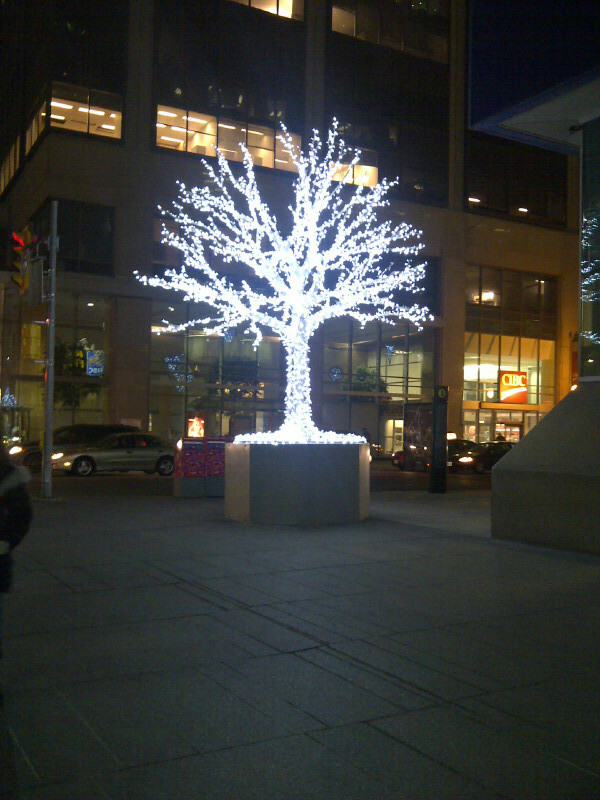 It sits at the northeast corner of Yonge and Bloor, just a couple of streets from us. It first went up, in celebration of the Christmas season, last year. And immediately upon seeing it, Ruby's heart was captured. She could stand for hours just looking at it. Once she spent almost fifteen minutes slowly walking around it, looking up at the branches in awe, absolute wonder. When I'm giving her a lift in my wheelchair she likes me to rush ahead so that we can have the maximum amount of time at the tree as we wait for the others to catch up. I don't know how but suddenly, in her mind, the tree became a holy place to her. She approaches it, reaches up and touches it, and closes her eyes. The first time she did this she looked from the tree to me and said, making an announcement, "This is the Wishing Tree." She noticed, once, that I always watched her wish but never did so myself. She levelled her gaze to me and asked, "Dave, why don't you ever make a wish." I was feeling a bit tired, and said, "Oh, Ruby, I'm a bit old and I don't remember how to make wishes like you do." She said, not noticing that my eyes were glistening, "It's easy," and took my hand and placed it on the tree, "now close your eyes and wish for something you really, really, want." I did as she asked, realising that I don't think I've made a wish in a very long time. I use the word, "oh, I wish he would just shut up," or "oh, I wish this line would move faster," or "oh, I wish I didn't have to pee right now." But a true, deep down wish, that I haven't done in a really, really, really, long time. She watched me make a wish. I told her that it was because it was. She asked me what I'd wished for and I explained to her that I couldn't tell her because that meant it wouldn't come true. She listened, thought for a second and said, "I don't think that wishes come with rules." Even so, she accepted with ease the fact that I'd kept my wish secret. And even though I suddenly wanted to tell her, I didn't. On our way home from the Messiah, humming, 'For unto us a child is born' I stopped at the wishing tree. I put my hand on it just like I'd been taught. My first wish, yes, I'm telling you because wishes don't have rules. I think the little anarchist is right, was that Ruby's wishes at the wishing tree come true. And I think, maybe they will. A couple mornings ago, I was up early, Ruby was the next one up. She came quietly into the den where I have my computer set up, she likes to surprise (scare) us and, she stopped and watched, I did not know that she was there - as I had my head bowed in prayer. As I prayed I felt two arms reach around me and give me a hug. I smiled at her and hugged her back. "Were you wishing?" she asked, and I said, "No, I was praying." "Because it looked like God was hugging you." May you make many wishes. May God hug you when you most need it. When I make complaint regarding something to do with access or attitudes to a company I am often offered some kind of compensation, a gift, for my 'inconvienience.' I mostly refuse these offers. I want them to understand that I am complaining with the goal of 'change' not with the goal of 'gain'. Part of me believes that as soon as I take what's offered, I'm written off and my complaint is seen as just a little more frivolous. Part of me also believes I need to stay focused on inciting change and change doesn't come in a gift box. So, with rare exceptions, I don't take up offers of personal reparation. Today is a rare exception. 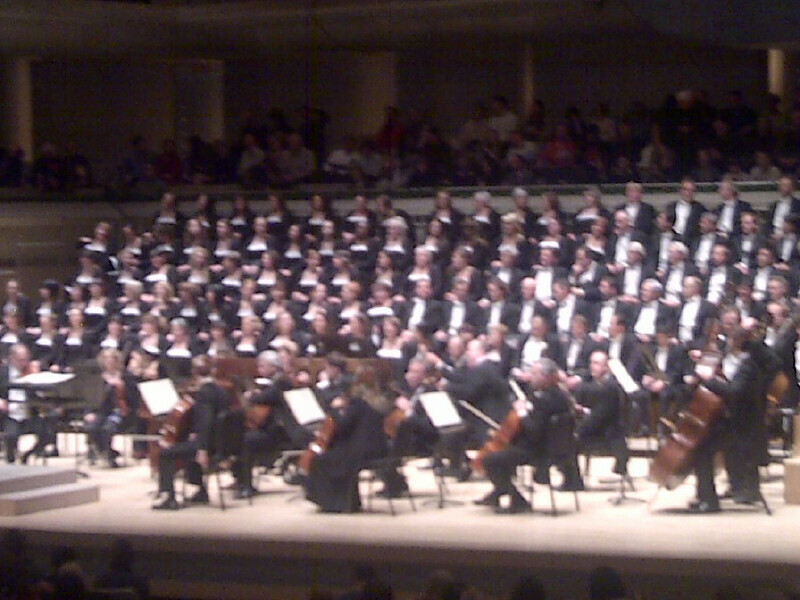 Last year I wrote a blog about my visit to the Roy Thomson Hall to see Handel's Messiah. It hadn't been a good experience. As a result of that blog I had several conversations, all productive, with representatives of the various parties involved. I ended up being satisfied that my concerns were taken seriously and that there was a real desire to improve the experience of people with disabilities as customers and patrons. More than that I felt that the people I spoke to really, really, wanted me to trust that they would continue to work on the issue of accessibility of space and of face. They offered me the opportunity to attend another event in the Hall put on by the Toronto Symphony Orchestra as a gift from them. I told them that I don't complain for tickets, they assured me they understood that. I said I'd think about it, knowing that I wouldn't, knowing that they knew I wouldn't but that it would be a nice way out of the stand off. Then a few weeks ago, out of the blue, we got a phone call, inviting us to come back to see the Messiah again this year, for free. I was astonished that the incident last year was remembered and that we were being offered the opportunity to go again. Joe and I talked about it and, as so much time had passed, we could only see this as a kind gesture by people wanting some kind of closure to the events of the year before. We talked about it more and I realised that my experience last year really diminished my enjoyment of the afternoon and that I'd like to have a different memory of attending one of our two favourite Christmas oratorios. We agreed. I am writing this the morning before we are heading out to attend the event. I am relaxed and looking forward to going. You see, I believed that everyone I talked to last year was sincere about their desire to make change. I believed that my voice had been heard. I am looking forward to going. I am looking forward to being there with Joe. I really enjoy the music and the emotions that well up in me when I hear the Messiah performed. But I really love being there with Joe who really, deeply, loves this music. It's something that we share together. OK, that was written before going. Now you are all wondering, "OK, what happened?" There wasn't a single negative incident, it was a muss and fuss free 'Messiah.' But what I do want to note is how incredible the staff of the hall were with everyone, including people with disabilities. I noticed an usher notice an elderly woman standing near the door, obviously having some difficulty. All the chairs provided for seating were taken. The usher disappeared and moments later reappeared with a chair. She offered it to the woman who took it gratefully. Several other incidents of what could be categorised as either exceptional customer service or simple and lovely kindness happened all around me. It was truly wonderful to see. I promise you, and those of you who know me at all well would know, the ticket being free had nothing to do with my opinion of what I saw. I now have a new memory to replace the old. And, even better, I now have another venue where I can go without worry. Can you all say ... (yes, I'm going to do it) ... hallelujah! Two stories appeared this week, in papers across Canada, about the mistreatment of people with disabilities in group homes here in Ontario. One story begins with an interview with David White the other, quite different story leads with an interview with Lisette Lanthier, both of whom are self advocates with disabilities. While I am not going to, in this post, discuss the content of the articles by Michael Tutton, as I believe they speak for themselves and are compelling reading enough without my having to comment on them. I will say here, what I told Mr. Tutton personally, stories like these, written by a watchful and questioning media are part of the solution. The media needs to take interest in what happens behind the closed doors of service systems, the media needs to take the responsibility of watchdog seriously. There are many things that we can do as parents and service providers to prevent abuse, but a watchful media has an important role in ensuring that what we say we do, we do. But what I really want to talk about is the amazing inclusion of the voices of people with disabilities in a story about the lives and experiences of people with disabilities. Stories like these tend, or have tended, to focus on the voice of experts, all without disabilities, in the field of disabilities. It's like there has always been a subtle agreement that people who have the lived experience of having disabilities are so busy being disabled that they haven't had the time or, if they did, the capacity for understanding their own lives. As you will see from one of the stories, I am interviewed, so I knew that the stories were being written, moreover, I knew that Mr. Tutton was planning on interviewing people with disabilities for the piece. I was beyond pleased when he told me that he was planning on moving past the experts to speak to the experts. I happen to know both David White and Lisette Lanthier and I was absolutely pleased and thrilled that these two remarkable people were going to have the opportunity to find an audience for their views. I do not call either of them remarkable for any reason pertaining to their disability. I find that kind of 'pumping up' objectionable. I say 'remarkable' because of their ability, each of them, to speak their minds clearly and express themselves thoughtfully. If you watch interviews of people in the street or politicians, being able to speak plainly and cogently is indeed remarkable. Anyways, each piece leads with their interview. In doing so Mr. Tutton gives a sense of the gravity of the mistreatment of which he writes. This is something that happens to the Davids and the Lisettes all around the world, people who are people who live within care systems. It wasn't long ago when people with intellectual disabilities weren't allowed to have names, or to have identities, let alone being given space to have voices. I imagine still there are places where people with disabilities would not be allowed to comment on stories like the ones just written. Lisette and David are at the leading edge of people with disabilities who are willing and able to speak about their lived experiences as people with disabilities. Up until now people with intellectual disabilities have been allowed opportunity only to tell one kind of story - the kind that inspires others, about achievement or about dreams fulfilled. Those stories are important, they too are part of the experience of disability. But so too are stories about abuse and mistreatment and bullying. So too are commentaries on the service system and how it needs to change. So too is the need for justice and the right to respectful treatment in the community. Lisette and David appear, pictures and all, proudly public and confidently outspoken about their views. Behind these two people are families and service agencies who have worked to ensure that 'voice' and 'choice' are part of the real lived experience of those with disabilities. The decision to speak or not to speak rested with each of them. They are there because, ultimately, they decided to be there. Others moved out of their way and handed the microphone over, at last, to those whose lives had been lived in shadows and their voices hushed away into silence. Halleluiah, anyway, I'm not where I started! how miraculously kind some people can be? This book, and this poem, meant so much to me. The book sits beside my desk and has become my 'when I need to ponder' book. She write evocatively with images that somehow bring me to a place where thinking is possible. They cut deep into his brain. They implanted some kind of electrodes. He said he was excited. He said he was frightened. The story aired on a local television station here in Toronto a couple days ago. A young boy, a grade 8 student, had a rare condition wherein his body was overtaken by constant shaking. He dreamed of being able to fill a glass of water. He dreamed of being able to eat on his own. The operation held out the promise that these dreams would come true. A reporter interviews him and shows film clips of him before the surgery. As the interview continues it unfolds that the young boy, grade 8 and anticipating grade 9, was being teasedwithout mercy, without ceasing at school. He dreaded walking the hallways. He was terrified each day on waking. His mother, who loved him, who's voice conveyed such affection, spoke of her heartbreak as he began staying home, not wanting to go out. The stares of others, the glances that cut, the comments that pierced, well, he just couldn't bear them anymore. He began riding in the car only with the windows up. So people couldn't see him. He lived in fear of students. He lived in fear of shoppers at the mall. He lived in fear of other drivers, other passengers. He lived in fear of people. Grade 9 and the transition to a high school filled him with dread. He knew it would get worse. He faced his future with fear. Then there was the possibility of surgery. He wanted to pour himself a glass of water. He wanted to independently feed himself. He had surgery. It was successful. The reporter, playing for the tears of viewers, has him pour himself some water, feed himself some food. He talks about being at the new school and that the teasing had abated. He talked about no longer fearing going to the mall. Mother is relieved. He is happy. And the reporter ... indeed all the media asked all the wrong questions. They asked him what it was like to be able to pour himself water. They asked him what it was like to be able to feed himself lunch. They asked him what it was like going to the mall. Asked of the wrong person. Why didn't they ask how it could be that we live in a society that a boy lives in fear of going to school, knowing the bullying he faces because of his disability? Why didn't they ask how it could be that the we have come to believe that we have to implant electrodes deep into the brain of a young boy in order for him to gain even the slightest bit of social approval. Why didn't they ask how it could be that the responsibility for the bullying was transferred to a boy that shakes rather than a system that tolerates hatred and acts of hatred? Why didn't they ask what would have happened if the surgery hadn't worked? If he couldn't pour water but still had to endure the unendurable walk down a hostile hallways. Why didn't they ask people to think about the thousands and thousands of kids with disabilities, kids with differences who RIGHT NOW are fearing the morning, fearing the bus ride to school, fearing their fellows? Because he could pour himself water. And that makes a good picture. Because, in some small way, they, and all like them, really don't, down deep disapprove of kids born with a target on their back being shot at. Sunday was a day for a family outing. 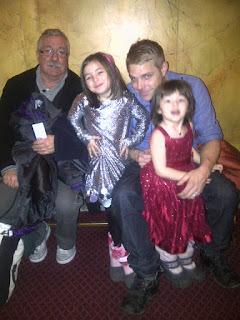 Mike, the kids, Joe and I went to the theatre to see a Christmas panto called Snow White. Going to the show took the entire weekend. On Saturday the girls went to get their hair done. Sadie kept saying, "I'm not going to cry," when she talked about getting her hair done. Later she determined that she was going to tell Bill, the hairdresser, that if he was going to was her hair he needed to use water, not just soap. We agreed that she would give him instructions on how to wash her hair. She nodded her head decisively, pleased to now have control over what was going to happen. Bill looked amused as she gave him instructions but got right into it, asking her both permission and direction all the way through the wash and cut. Ruby got her nails done while Sadie got her cut, then they swapped places. Ruby loves getting her hair done and agreed, reluctantly, to her mother's wish to have her hair cut a little bit. She likes and trusts bill so she sat back and relaxed as he did her hair. She falls almost into a trance when she gets her hair done but she did agree to a picture just as she got into the chair. So with hair and nails done we went home and did some cooking. The girls really got into decorating their gingerbread people. Ruby was insistent that her's was a girl. They robbed some of the marshmallows from a box of Lucky Charms to add to their choices in decorating the fine fellows. Sunday morning involved all getting dressed up. Well, that's not entirely true. The girls got dressed up and the rest of us guys just got dressed. We all figured we made a fine backdrop for the two elegantly dressed girls who made their way with us to the theatre. 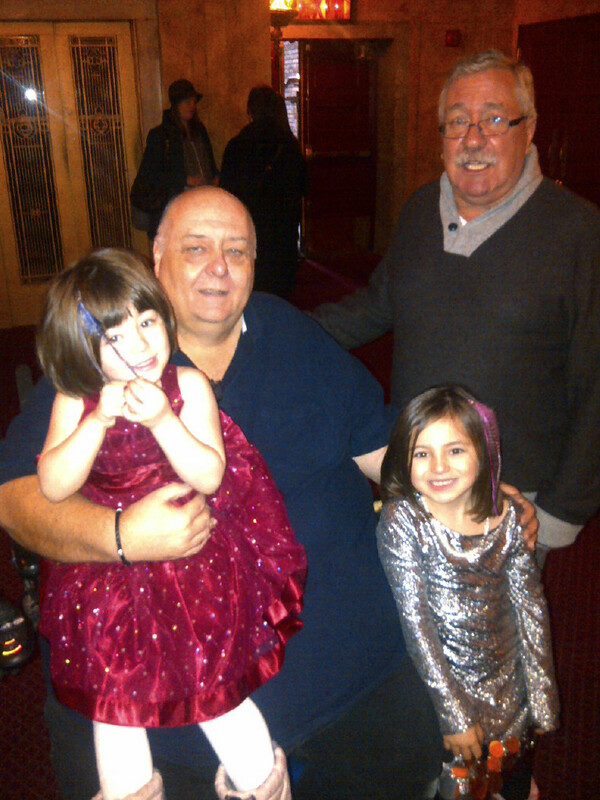 It was a wild and wonderful time at the panto, we got there early anticipating that there would be a problem and it was, with one small hitch, virtually problem free. It's an old theatre so they have to take out some seats to make room for the wheelchair and they installed a kind of wooden platform for me to roll up on, which was great because otherwise I would have sat on a slope the entire time. From where I sat I could easily see the faces of all those accompanying me. I saw Ruby laugh out loud at the sight of a toilet seat on stage. I saw Sadie dancing to a rousing version of 'Firecracker'. I saw Mike burst out laughing at the 'Luke, I am your father,' line and I saw Joe rolling around in his seat - he's a good audience for a comedy. From my vantage point, atop my wheelchair, atop an installed floor, I saw it all. What was the slight hitch that we experienced? I'm not going to write it down. I choose to remember what we laughed about. Because that's what I want to think about when I think about the girls first night out at the theatre. There is a house that I see quite regularly on my trips up to work on WheelTrans. Every driver has their own unique way of getting me from where I am to where I'm going so my route is always different. More than that, every ride has different people with different destinations, so often my route from one day to the next is completely different. But, still, there is a house I see fairly often. It always takes me by surprise because I've developed a habit of killing time playing Word Mole on my phone enjoying the extra challenge of hitting the letters to make up a word while rolling around in my chair as the bus chugs along - I look up less than I did before. So, when I see the house, I'm always surprised. I noticed it first off because it was under renovation and I could see by the trucks servicing the crew working there that they were installing an elevator. It's a large old mansion and as they'd been tearing up some of the interior I'd glimpsed in at a huge beautiful space. The elevator had me drooling with envy, how cool would that be. I always loved Katherine Hepburn's entrance in Suddenly Last Summer as she descended, talking, into the foyer of a beautiful home whilst sitting in an ornate elevator. I did feel the prick of envy when thinking of the rick folks moving into a mansion - with an elevator. The huge imposing steps informed me that any fantasy about somehow getting to know these folks and somehow getting a dinner invitation and somehow having to use the upstairs bathroom so that I could ride in the elevator up and ... descend talking, was a little unrealistic. With the trip overseas, I'd not been by there for a fairly long time when I passed there a couple weeks ago. I looked up and saw that the house was nearing completion. To my surprise a long and beautiful ramp had been installed, so wonderfully designed that it fit right in as if it had always been there, always been planned for, and generations of wheels had made their way up and onto the veranda. Hum, the fantasies back. I may just have to write an elevator monologue after all. I don't know why but my immediate thought was that some rich family had a child, or a parent, or a friend who was a wheelchair user. I know that I thought it was wonderfully kind, I've got to stop that, that they'd built a means of access to ALL of their friends and family. How very nice. Then when I went by the house this week I was startled to see that the house is now occupied and decorated lavishly for Christmas. The fellow leaving the house, in his wheelchair via HIS ramp, is a suit and tie guy maybe in his late thirties. His wife, also lovely in her suit, followed him and they kissed, got in their separate cars and went off. An ordinary enough scene all across the city. I don't know why, in my mind, the house was being adapted for someone with a disability, not by someone with a disability. 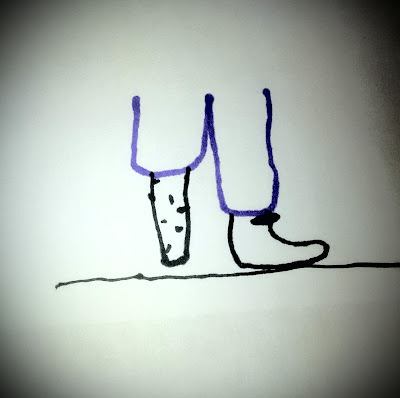 I don't know who has put fetters on my imagination, but they are there. There is a house, with a ramp and an elevator and a family. It is as it should be - yet I still have trouble imagining it a possibility. It was a powerful sense of sadness. I logged on at work and there was a message stating that my mailbox memory was nearly full and I had to delete some messages from both my "inbox" and my "delete folders". I decided, then and there, to just get it done. I was surprised to see that I hadn't done any clean up of my emails since I started at Vita nearly six years ago. I went to click delete and then saw that it was from Manuela, Vita's Executive Director at the time who suddenly passed away a year and a half ago. I read the email. It was written in a style that was unique to her. It seemed oddly formal and then I realised that this was at the start of the journey we would have together over the next several years. It was hard, and it felt like a betrayal, but I hit delete. Over the next hour I stopped now and then when a 're' line struck me as interesting and I found that I was tracking the course of our relationship as both boss/employee and as friends. There were the outraged emails she wrote when she disagreed with something on this blog. There were the congratulatory emails she sent when something I'd worked on had gone well. Delete. Delete. Delete. A couple of times I read something that made me laugh out loud. A couple of times I found myself wiping away tears. A couple of times I paused to wonder at the odd relationship we had. That powerful sadness which first struck me began to give way. The incredible guilt which greeted each push of the delete button also gave way. Because I realised that I didn't need virtual memory of our relationship - I've got the real thing. I was recently in a room surrounded by other gay men. I'm not often in an all gay environment and it should feel a bit like coming home. No matter how much I am fully engaged and included in the larger community, there is a difference that is always subtly there. When we were younger Joe and I would talk about how we needed to go to a gay bar or a gay event just to escape the sense of being surrounded by heterosexual culture and heterosexual assumptions. Since I've become a wheelchair user, that opportunity has virtually disappeared, few of the gay bars in the city are accessible and as such we've grown deeply out of touch with what's going on and the social opportunities that are available. But, back to being in a room surrounded by gay men. I became aware of it because of a whisper. I looked over and saw two men, my age, looking over at me. They were suppressing giggles. I glanced around and saw that my arrival in the room had thrown a rock into the pool of hilarity. My weight, my wheelchair, the 'all' of who I am seemed to make me the perfect foil for jokes and for eye rolls and facial OMG's. I went very still inside, like I do when I realise I am not safe. I looked for, and found, a place where I could move my wheelchair to to be out of sight of the group. You may think that you would not have moved. You may think that you would have said something. But there are things in this story that I'm not telling you, and those things would have made those responses entirely impossible and highly inappropriate. I do have to edit my life sometimes. But the saying something or the moving are not what this blog post is about. It's about something much deeper than the temporary discomfort I felt in that moment. It's about how people seem incapable of LEARNING from their own experience and applying it to the experience of another. The It Gets Better project, with it's laudable goal of supporting LGBT? youth who are experiencing bullying and teasing demonstrates the power of a communities response to a serious issue. The idea that 'It Gets Better' is one that gives hope of a brighter future to kids who are in hostile environments. One would hope that those who experienced Bullying and Teasing in their youth, or in their workplace, or in their church or in their family, would have a deep, deep, deep understanding of what it's like to be on the brunt end of a pointed finger, to be on the sharp end of another's joke, to be struck across the face by words that hurt, to have blood drawn from the hostile stares of others. One would hope. In my mind, I like to imagine that everyone who experienced bullying, experienced the sense of 'outsiderness' that comes with difference, would be really cautious and careful with their words, their attitudes and their actions. But instead it seems to be more like, ... It Gets Better, In Fact It Gets So Good That You Get To Become The Tormentor. Why is it wrong when something is done to us but acceptable when we do it to others? I think it's because we see ourselves as innocent victims and those we do it to as 'deserving' it in some way. Our behaviour becomes defined by the 'otherness' of the 'other' what is held in common is brushed aside while that old, old social equation of difference = lesser gets pulled out and dusted off again. 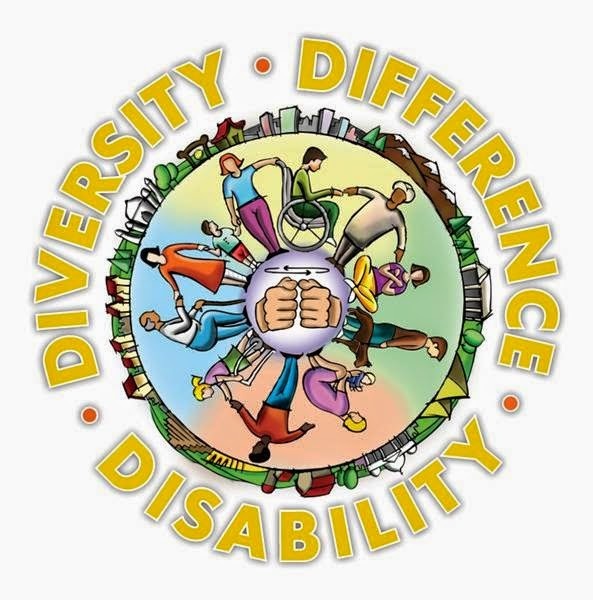 I think, therefore, that those of us in the disability community, who experience prejudice or inaccessibility should be hyper alert to our own prejudices and our own attitudinal inaccessibility. I think that because we KNOW we have a responsibility to put KNOWING to good use. Life is lived for learning, is it not? The first time you are called a name, the first time you feel that sting, should be the last time you ever call a name. Right? It's another simple equation, one that I prefer. The girls each grabbed their new sweats from Roots and headed to the bedroom to change into them. We had purchased them as Christmas presents but when they were here for the weekend, I simply couldn't wait. I used the excuse that I wasn't so sure about the sizes and I wanted them to try them on because if we need to take them back and exchange them, that could be done before the big day. Mike and Joe smiled knowingly and the kids gleefully tore into the bag to see what was there. I love giving 'warm' gifts. Throws. Blankets. Those kinds of things. These, when I saw them, just fit the bill. 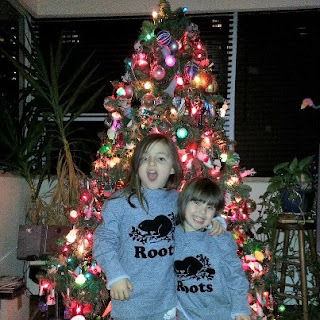 Roots makes really fine clothes and when I felt the sweats, the first thing I thought was 'ummm, warm.' They were in my shopping bag in an instant. I just loved imagining the girls getting in them and feeling all warm and snugly. When they arrived for the weekend, it was cold out. Really COLD. The air was doing that magical thing where the coldness seems to snap and spark in front of your eyes. I knew that they had to have their sweats, then and there. Kids need to be warm. After they were wearing them, curled up together in our big chair and deep into watching Arthur Christmas on DVD, I was joking with Mike and Joe about my inability to hold back on things like this. It really could have waited to Christmas. I said, "I really have a problem with waiting to give the girls some of their gifts." A voice came from Ruby, eyes still glued to the television, "I don't think that's a problem at all." So I guess, everything, our personal idiosyncrasies and peccadilloes included, are all a matter of perspective. On November 14th, in dealing with a company, I was brought to tears because of the way I was dealt with as a person with a disability. They had something I needed, as distinct from wanted, and as such I had to put up with an extraordinary, and unthinkable, amount of frustration. In the final moments, and this is rare for me, I broke down in tears. Joe watched helplessly as this all unfolded over a two hour period that I was on the telephone - mostly on hold. He, like me, couldn't believe what was happening. I asked the woman if the call had been recorded. I told her that I was going to write in and make a serious complaint about the ordeal. I don't think she cared all that much. And, here's the thing, I didn't write. I started to several times but every time I did, every time I realised the length of the story and the depth of my emotional reaction to it I simply pushed away from the computer. I couldn't do it. I let myself off the hook, as I normally chastise myself for not at least writing a complaint, because I felt emotionally traumatised by what had happened. But today ... I started to think about it again. This time with less emotion as the distance, in time, has allowed me to see that I had every right to be frustrated and that what happened was simply outrageous. Simply. Outrageous. And I'm ready to write that letter. I thought I'd ask you. "Thank you for your patience," she said. I indicated the kids she was pushing and said, "Well if we want kids to learn patience, we'd better show them from early on how it's done." "That's very kind of you," she said. I said, "Not at all, not at all." "But," she said, "isn't patience at the heart of kindness?" I laughed. I don't know why. Perhaps simply because I didn't know what to say. It was a nice, simple, moment with another person. But gosh it's got me thinking. We were walking along Bloor Street heading towards home. I was with people I know, nearly but not quite friends, and we were talking and laughing. Suddenly we all noticed a fellow coming towards me, a well dressed, pleasant faced, man. He was making kind of odd throttling gestures with his hands and he was definitely headed for me. Then he made a quick lunge, while still a ways away - maybe two or three feet, and then stormed by me. "Did you see that?" I said with a shaky voice. My companions immediately said that they did and how strange the whole thing was. "I was so scared," I said having trouble keeping my emotions in check. And then an even odder thing happened. They began joking about how I could just power my chair up and ram into the guy, how I could back over him as he lay on the ground. Further hilarity carried on between the two of them as they laughed and joked about how I could have used my power chair to wreak revenge. I tried to break in to their conversation, I really needed to be heard, "I felt really vulnerable." Again they joked it away saying that in my chair I was invincible that I'd have been able to 'take him out.' And, then they were off on more revenge kind of fantasies. I don't know when I've ever felt so utterly alone. I am not, I think, a coward. I am, however, controlled. I have had several comments from other wheelchair users here on the blog who write about how if something is in their way - they just push through the barrier and if things fall, so be it. I can only admire that kind of chutzpah. I don't have it. I am mortified and embarrassed if, by accident, I knock something over. In the five years I've had the power chair I've never run into anyone, certainly never purposely, and I'm very, very, careful and aware even if those who walk are completely distracted by 'i-ing' their way down the street. I pads and I pods only means I extra careful. So I'm not that guy. I tried a couple more times to get my feelings across because right then I really needed them to listen to me, to acknowledge that what happened was frightening and to give me a sense of their support. I'm sad to say, I didn't get it through. Maybe they don't see my vulnerability in the way that I feel it. But right then I understood that my experience as a disabled person often puts me out of reach for ordinary empathy. Maybe. A few days ago I received an email from a faithful reader of this blog. She was writing to tell me that another disability blogger had written a post attacking me and making fun of something I said. Now, let me state clearly, I have no problem with people disagreeing with me, calling me on something I've said, or asking me to re-think an opinion. As a result I have discovered how often I'm wrongheaded in some way or that I have used words too carelessly. Without struggle I can think of 6 posts that I've changed due to reader feedback. The posts are better because of it AND I've learned through the experience. On the other hand, I have discovered there are times when a challenge has caused to think about what I've written, I realise that I do really, deeply, believe what I have said and that the challenge has allowed me to deepen my thinking. While there were many times in my youth that I took criticism too personally and as a result felt under attack, I am no longer, nor have I been for a fairly long time now, that person. I have grown to like debate and to like perhaps the most important of diversities - the diversity of opinion. I'm good with all that. So, when I heard that there was a blogger out there disagreeing with me, I was OK with that. What I wasn't OK with was the kind of 'behind your back' attack that it was. As I read it, I realised that the goal of the post was to mock me not challenge me, to call me 'stupid' without chance of rebuttal. I also realised that the quote taken from my writing was accurate but the way that it was was discussed was not. I wasn't sure what to do. I didn't comment as I didn't want to engage with someone who had decided not to engage me. Perhaps I should have but I kind of felt that I'd be playing into some kind of odd game. Also, I am not going to link to that post because I don't want to reinforce that behaviour with too much attention. I am writing this to ask all of you who read this blog - if you are going to disagree with me, in print or on the web, let me know. You certainly don't need my permission - have at me, disagree all you want, but have the courage to tell me or engage me in some way. I've never, and don't ask now, asked people to alert me when they link to a post or write something positive - I find out anyways through the links feature of 'Sitemeter.' 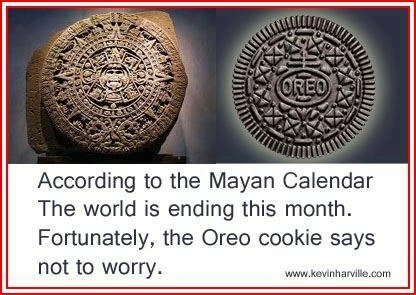 So don't worry about that. Disagree with me! I love having sparked cause for discussion and debate. But don't attack me behind my back, I'm so not good with that. Sorry to take up a whole post with this, but it's something I wanted to say.